I recently updated the NIC driver on my work computer in an attempt to fix a BSOD problem. The computer has rebooted from a bugcheck. The bugcheck was: 0x0000009f (0x0000000000000003, 0xfffffa800d1eba10, 0xfffff80004d3a3d8, 0xfffffa802eba1c60). 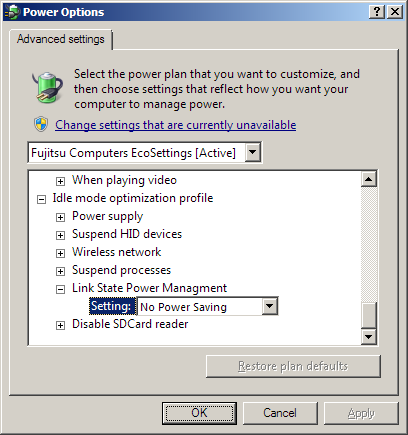 Noticed multiple settings called Link State Power Management and decided to disable them. 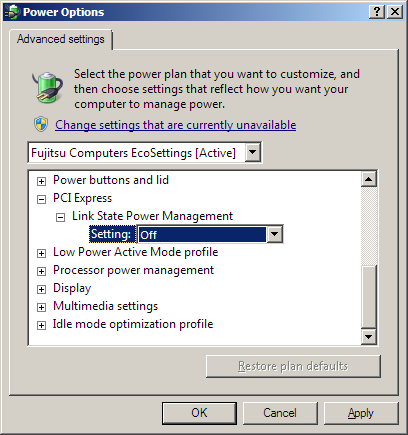 It seems that none of the standard power plans disable these settings, not even High performance. 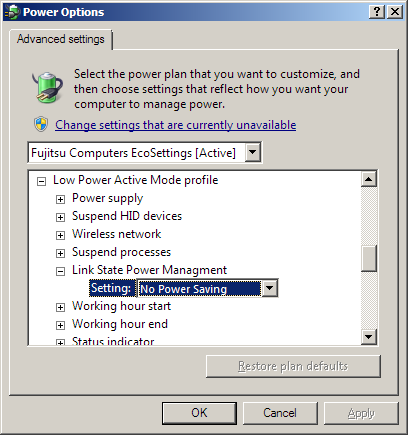 If you switch between multiple power plans, you will have to modify them all. After modifying the power options I have shut down the computer to sleep mode successfully 15 times without a single hang. Disabling PCIe Link State Power Management seems to have fixed the DRIVER_POWER_STATE_FAILURE (9f) BSOD problems.